justifiably so. You simply aren’t going to find any champion scullers whose VO2 max, anaerobic threshold, and lactate tolerance are just fair to middling compared to those of the general population. If you expect to win boat races, you had better put in thousands of miles and hundreds of high-intensity interval workouts. But do we train the nervous system? Too little attention, though, is paid to the best ways to train the nervous system, and it’s worth exploring the idea that this is just as vital to one’s success as a sculler. We have all observed that people who sit rigidly in their shells, brimming with anxiety, are rarely effective boat-movers. Their tension prevents the flowing, comfortable, rhythmic motion that is necessary to go fast, much as a beginning swimmer who is uncomfortable in the water merely thrashes about and doesn’t get across the pool very swiftly or gracefully. 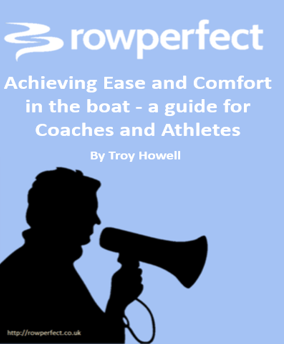 Coaches give us the crude instruction to “relax” but once we achieve some acceptable baseline of comfort in the boat, not much more is usually said or done to promote it further. Scullers who feel pressed for time laugh at the idea that they might get more out of spending a few minutes on balance drills rather than another five-minute piece. The fact is that a sculler’s level of comfort in the boat and his feeling of having mastered his environment go a long way toward determining both the outcome of his races and his enjoyment of the sport. When you can sit at the catch with blades square and feel nearly as comfortable there as you do sitting in front of your television or at your dining room table, you’ve achieved something more valuable than you might suspect, and it will improve your whole stroke cycle. A sculler who is anxious at the front end will usually hurry to get that part of the stroke over with, rushing through the catch and thereby destroying the steady rhythm that he ought to be striving for. And with every stroke he takes, he’s training his nervous system to be more nervous. Start by simply sitting still at the catch with your blades feathered and on the water. Notice any tension anywhere in your body, starting with your hands and your face. If there is any present, let it go by reminding yourself that if your weight is truly over the keel of the boat and your hands are at the same height, that the boat will remain upright (the laws of physics won’t change just to get you wet). When you feel comfortable, repeat the process – but this time with square blades – then take a break and sit easy. Add a degree of difficulty now by going back to the catch with square blades, get comfortable, and begin tapping the handles down to get the blades out of the water. If you tap down at the same time, for the same distance, and let them fall simultaneously, the boat will achieve a dynamic stability. If your timing is off, it will want to roll. If you make a mistake, don’t overreact – let your nervous system figure out how to absorb it calmly (I usually call this setting aside the “Ohmygod Moment”) and come back to even keel. When you’ve had enough of that, go through the whole stroke cycle very slowly with your blades squared and in the water throughout the process. Pay attention to how everything travels throughout the stroke, especially your hands, shoulders, and hips. After that, try taking a full backing stroke, all the way to full compression at the catch, and immediately reversing direction to take a stroke. Pause at body over. If that didn’t produce an Ohmygod Moment at the catch, give yourself a pat on the back. If it did, try it again until it doesn’t. Make up your own stationary activities and become proficient at them. Learn to wear your boat comfortably. Own the space you sit in. You’ll go faster and enjoy sculling more. This entry was posted in Coaching, Exercises and Drills, Sculling, Technique and tagged rowing. Thanks for this – just started racing in my single (masters G) – never thought of training to relax, rather than training in skills, so you can let yourself relax through confidence. Thanks for your comments Donald, Marivel and Graham. Yes relaxation will give you good boat speed at beginner level – it’s darn hard to do during a race though! But if you watch videos of top athletes, they all make it look “easy” – that’s partly good consistent skill and partly relaxation. Thanks much. I wish I’d spent more time on stationary drills and just playing in the boat when I was in my twenties. Youth wasted on the young indeed. 3. entrained breathing – commonly out at the catch and release. 5. No pausing ( except with the legs down). To avoid this arrange that the legs finish WITH the arms, and immediately rebound. Visit Youtube Rhecon sculling to see this, albeit done on an erg. 1. Once the blade is past the rising knees leave the arms a little bent. The blades stopping will then pull them straight at the catch, and immediately they will rebound-hopefully with the blades in the water..
2 Adjust the gate angle so that a good blade depth happens without vertical effort. 3. Ankles: In the recovery don’t pull on the toes. Relax the ankle throughout the stroke. Presumably “relaxing” means not using muscles and energy, thereby leaving more for driving the boat.